Emergency call: "Miss, haven't you located us yet? We will freeze here"
ISTANBUL, Turkey (CNN) -- A passenger who survived a Turkish helicopter crash pleaded by phone with emergency services to rescue him in the bitter cold, Turkish media reported Thursday. 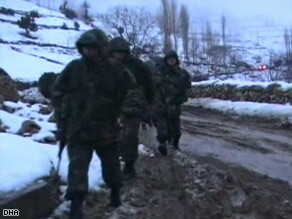 Soldiers tramp through snow and ice as they search for the downed helicopter. As a search for the crash site continued, TV stations broadcast the harrowing emergency call made by one of the passengers, reporter Ismail Gunes, after the crash Wednesday. "I'm starting to freeze. I feel cold," Gunes said in the call. "It is snowing. I am inside the helicopter. I guess the people here died. Erhan, brother. Erhan, brother. Nothing. No sound from anyone. So bad." At least six people were on board the helicopter when it went down in the mountains of eastern Turkey on Wednesday. Among them was Muhsin Yazicioglu, head of the fringe Great Union Party (BBP). The search crews included "the military, gendarmes, about 1,000 ... village guards as well as civilian rescue teams," he said. No sign of the helicopter had been found, he said: "The wideness of the area, the difficulty of the terrain and the weather conditions make it difficult to reach a conclusion." He said search parties were relying on "mobile phone signals and the possible course of the helicopter" since "unfortunately the helicopter's own signal did not work." In the emergency call broadcast on television, a female dispatcher tells Gunes the police are trying to locate him. He then calls out again: "Erhan, brother. Brother, try to (open your eyes). He is lying, moaning." "Is there any other sound from anyone?" the dispatcher asks. "No, no," Gunes says. "My foot is broken badly. Miss, haven't you located us yet? We will freeze here. I guess the other people are dead. I can't move my foot. It is broken really badly. When will you determine our location, miss?" The crash happened in a mountainous region of eastern Turkey amid rough terrain and adverse weather conditions, officials and media reports said. The crash occurred just days before municipal elections are scheduled to be held across the country. Yazicioglu's Great Union Party is one of the smallest of at least 10 political parties expected to take part in the March 29 elections. Parties across the political spectrum canceled campaign rallies Thursday in the wake of the accident.